Yesterday was a good day at Dumbarton Rock. I turned up to find Malcolm Smith had just repeated my problem from last winter Pressure, confirming the Font 8b grade and looking like he enjoyed it. I came to continue working on a line coming out of the left side of the Sabotage roof. I've been trying it for two years or more. It's classic Dumby technical and although I spent a stupid amount of time trying countless different methods, I knew just from looking at the rock, that there was a sequence there, I just needed to find it. Finally I worked it out and yesterday I linked it to give a new Font 8b - 'Sanction'. It climbs from a sit start following the line of holds across the left side of the roof through a sloping ramp feature, pulling onto the left side of the BNI slab. This is a really logical line, but my real goal is to climb the roof traverse (taken by Perfect Crime) and link this into Sanction. This way you'd be climbing the whole roof in it's entirety. After I'd done the sitter I got further than I expected on the link up. So now I feel that I should drop some other plans and concentrate on this until its done. It would be a worthy hardest problem at the rock. The psyche is on. It was a major relief that the PIP joint of my little finger seems to be reasonably stable again and is giving me few problems once warmed up. Heres hoping it can take the punishment coming up over the next couple of weeks. 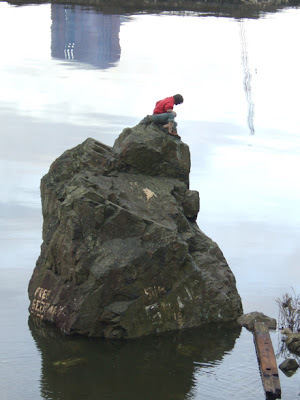 Maybe it's just me, but I've been on this boulder a LOT in the past 13 years and I've never seen the tide so high around it. Rising sea level? Michael Lee throws for an edge at Dumbarton today. 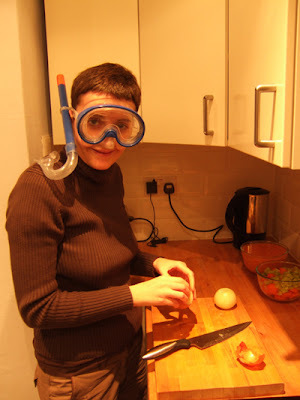 Those of you who have been reading this blog since I started it in May 2006 might remember I put up a post showing Claire's smart answer to tearful eyes while chopping onions. You can see the pic here. Well, as you can see Claire has incorporated a new technology to further enhance her safe and comfortable onion chopping experience while making the lentil soup. I cant get to my main site for a few days as my computer is ill with a nasty virus so can't get on dreamweaver. I've got lots of lectures arranged in the spring and early to put up on my lectures page. Here are some details of these, but have a look on davemacleod.com shortly to get the full details. 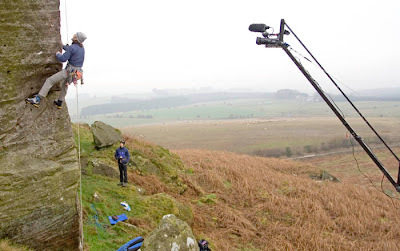 I've been told that the UK ice and mixed champs will be shown on the Adventure show on BBC2, March 25th at 7pm. Other news is that Scarpa have got their new range of rock shoes starting to hit the shops now. 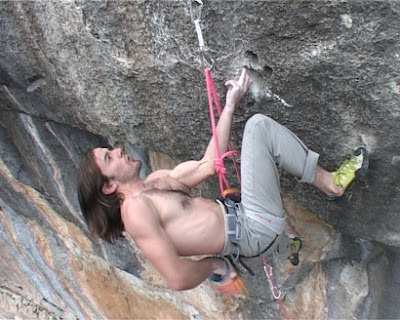 New product launches aren't not normally big climbing news but rockshoes are pretty important to rock climbers so something new is always interesting. More info about this here. Life has been way too hectic to manage any new articles on my coaching blog for a few months. But I wrote an article about training for climbing on the UKC website. It started off being about using climbing walls effectively and then headed off on a couple of tangents which hopefully you'll find interesting?? The piece is here. On March 25th I'm speaking at the SHAFF event in Sheffield talking about Rhapsody and other climbs, and showingthe film E11. You can see full details of the festival on its website which has a wizard which helps you plan which film programmes you should book onto to see your chosen films. 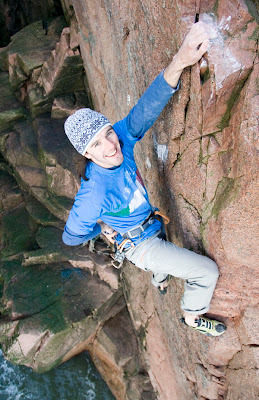 On May 10th I am giving a lecture about Scottish climbing and about Rhapsody for West Dumbartonshire Council's literary festival. The venue is still to be decided, but here is the page with details of the event. 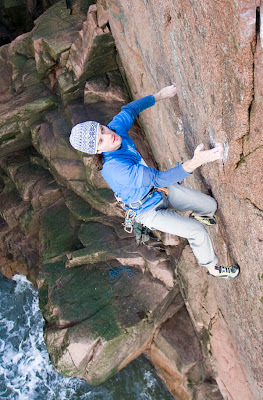 Enjoying an excellent sea cliff climb, Comfortably Numb E8 6c, Aberdeen sea cliffs. Photos by Hotaches Productions. If you click on them you can view the images bigger. Focusing in on the final move of Comfortably Numb. 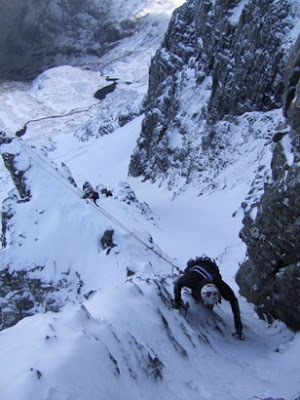 Leading Comfortably Numb with Dave Brown taking photos on the rope. Photo by David Ogden. I arranged with the Hotaches crew and Kev Shields (you need to get a blog mate so I can link you!) to head to the Peak for a few days but for once the forecast was best in the north and specifically the east. So a quick change of plan and we went to the county for a day and then the Aberdeen sea cliffs, to clean up a couple of quick repeats I fancied. In Northumberland we spent the first half of the day wandering in a moor looking for a crag while carrying a stupid amount of kit (yes that is a crane in the photos below!). So we sacked it and went to Rothley which even we could find. It was damp and drizzly and I brushed lots of chalk into the holds on Masterblaster Superdirect (E7 6c) to try and dry the holds. They kept coming through green so I declined to go for the onsight. Then I kicked myself after flashing it on the toprope! Serves me right I suppose. So I got that led anyway and salvaged something from a dank day with a lot of travelling and little climbing. Next day we travelled to the north east sea cliffs to try Tim Rankin's route from last year, Comfortably Numb E8 6c. I was pleasantly surprised to arrive and find Gordon Lennox already on it. 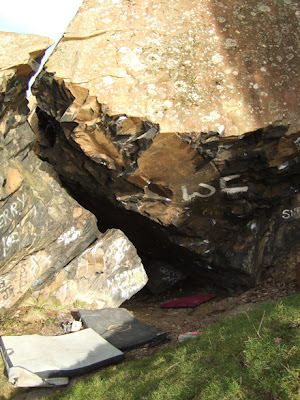 Its good to know that you have to queue even at E8 in Scotland - there is life in the trad climbing scene yet. So while big Gordon had the route, I abbed over the other side of the ridge with Malcolm Kent and onsighted Gies a Squid, a lovely E7 6c line up a slabby arete of pristine granite above the swell. It the first time I'd tried to onsight a route harder than E6 since 2001, so I was relieved that it was very much in the tradition of Aberdeen sea cliff routes - soft for the grade! The next morning Gordon nailed the E8 first try, so I got my chance. After a couple of half hour stints on the shunt I led it. 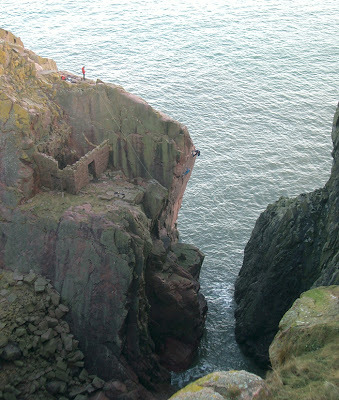 It was a superb piece of climbing, nice and safe with exquisite moves in a lovely situation above the sea. The hardest climbing is at the bottom too, so in the top half you can just relax and enjoy the moves. I was a bit worried that my pinky would dislocate again in the fingerlocks but it didn't happen thank god. 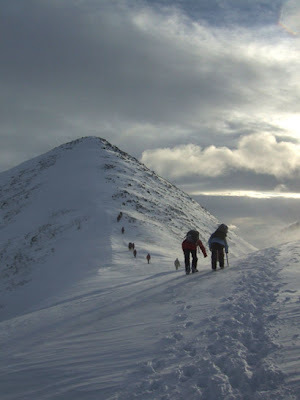 My ascent was the first placing the gear on lead. Last year I got a fair bit of flak for making comment about the style of the first ascent, where the gear was pre-placed. I felt that this style had well and truly gone out and that these days in trad climbing it is assumed you place all your gear on lead, all the time, with all but a tiny minority of climbers doing this. The criticsm I got was that the motivation of the first ascentionist was lost on me and that it was up to them how they chose to climb. Of course anyone has the freedom to climb a piece of rock however they please and this is a great thing. But to give a route a name and grade is to enter into the sport, not just the activity, and as such your actions affect others, not just yourself. 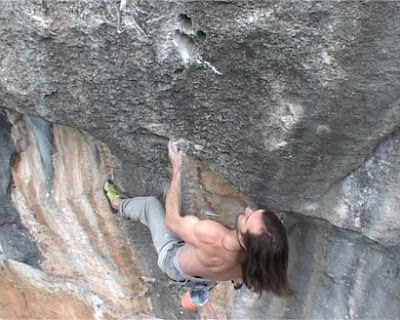 Would you claim a grade for a route you had only toproped? No, because the accepted standard is to lead. 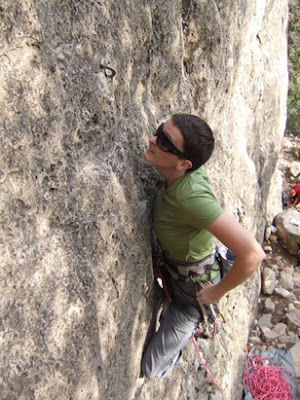 I trad climbing, the accepted standard is to lead placing gear. So its important to make the effort and do so in order to be fair to everyone else who goes to a lot of effort (training for years and risking their neck) to follow the accepted standard. However, this is really a side issue. The main thing is that I have enormous respect for Tim for going out and climbing the hardest route in his local area, and for climbing at his limit. Anyway, I felt it would be a good thing to show this by making the effort to travel up there and climb the route. And I can confrim its excellent. I guess I also put my money where my mouth is by placing the gear on lead. Where the hell are we? - somewhere on a Northumbrian moor. I was most impressed with Kev's necky lead of End Game E3 5c at the end of the day. It was getting more and more greasy as thesea spray stuck to the granite after the sun had gone. Kev went through that familiar process of trying to read his own mind for a confident decision that he could lead it safely. Kev only has one hand, so placing gear is extremely difficult in most situations. So most routes are really solos for him. He made the decision, looked a bit serious for 10 minutes, and then dispatched it. Relief all round, and we packed up and pondered a nice few days climbing in new places. Hotaches blogged about the trip here. 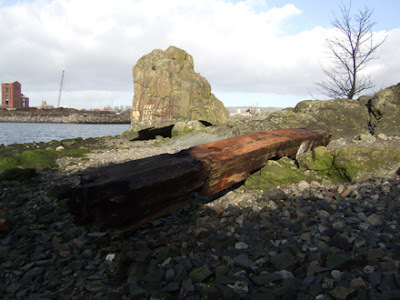 An impressive piece of winter driftwood at Dumbarton Rock last week. 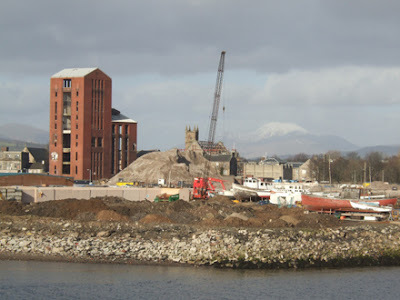 A snowy Ben Lomond peeks out from behind the ever changing architecture of Dumbarton. 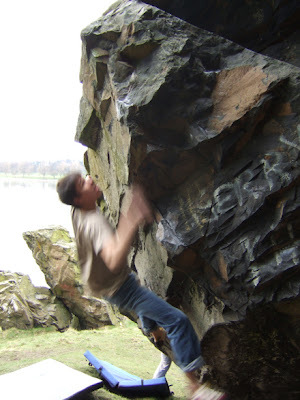 I have had a couple of superb sessions at Dumbarton lately and made significant progress on 2 boulder problems. Both are quite wild lines - about 25 metres long each, and more than 12 metres of roof climbing each! One in particular is very hard and is a step harder than the existing problems. In my efforts to get the 'pre-redpoint' link on this one, I had a nasty fall, coming off with a wild swing and face planted the floor. After I'd reassured myself that I had avoided breaking my nose I started to develop werid pains in my pinky which I twisted on landing. Later that night it dislocated at home and was really quite painful until I popped it back in. Unfortunately it seems to be making a habit of dislocating and hurting a lot when cold although so far it seems fine once I'm warmed up. We'll have to see how things go but I might pay a visit to the ultrasound scanner if it causes problems. Every year the American magazine 'Climbing' make an award for what they feel is the best performance of the year in each climbing discipline. This year's 'Golden Piton' awards were just announced and they awarded me with the title for best traditional rock ascent in 2006 for Rhapsody. It's great that Climbing appreciated the effort I put in on my new route. It's always nice when someone acknowledges your hard work. You can see the list of other winners this year here. There's been a fair bit of debate in the past few years about setting up more award schemes of this type as a way to encourage good performance and effort in climbing, and also allow the acheivements of climbers to be compared more easiliy outside the climbing world. Lots of people within climbing have understandable issues with this. The two main ones are that climbing is not about competition for many climbers and they fear that a climate of competition and such awards might end up promoting the darker side of sport - cheating and disrespect for others and the mountain environment. However, the benefits are potentially very good too, and may affect all climbers. When budget holders in government dish out the many millions of pounds to UK sport they are looking for prizes. The money goes to where the prizes are already coming from, as they have the biggest likelyhood of producing a return. Cynical I know, but there it is. Climbing and mountaineering in the UK is perpetually cash strapped because we have no concrete 'medals' of some kind to point at, despite still being the best in the world at trad climbing. HOW IRONIC IS THAT!!! Especially when you see filthy rich footballers trashing their form with binge drinking and getting banned for fighting, or sprinters getting banned for cheating after we have all supported them with our taxes for years. Since the olympics 2012 appeared on the horizon, climbing dropped completely off the radar for this type of support in the UK. In other sports, sometimes the performances of a few great athletes have lifted it's spirit and profile (and funding) enough to generate support (from government and media sponsorship) that trickles right through to all levels and corners. Winning a Golden Piton award in nice, but doesn't change my life one bit (the experience of climbing Rhapsody certainly did though!). However, if young British climbers in the future get more Golden Pitons, or whatever other awards are out there, that could eventually translate to things like climbing taught in the school PE curicculum, Funds to develop, protect and maintain crags, more and better climbing walls, more expedition grants, coaching schools to help young climbers get better, bigger and better climbing events, and the chance for any climber who is determined enough to become the best in the world, limited only by effort, not oppurtunity. However Richard is right that people do pay attention to these things so its worth making some comment to make clear that some routes are way harder than others with the same grade. I only visited Spain for the first time last year, but for many years I have listened to Brits saying how Spanish grades are a bit of a gift and to head there to get a good tick! That is not really a new idea. So yes, If I did L'Odi as a new route in Scotland, it would be a grade lower (8c), and the same goes for many routes there. It's about F8a+ to get to the crux, which is maybe a V8 or 8+ boulder problem and then maybe another V7 after that. Rhapsody is about F8a+ or 8b to get to the crux and I felt it was V11 at the top. Hence it took me a veeerrrryyyy long time to do it. Anyway, I've even bored myself now, so end of message. Summary - Spanish grades are kind, but you knew that already. I’m heading home from Spain now, worn out and sore from an intense few days of sport climbing. It was my third week long visit to Siurana during the past year. On the first trip I was really just cooling off after having just finished Rhapsody. At the time I was curious to find out if Rhapsody was 8c+ for physical difficulty, so I dogged up a beautiful 8c+ called L’odi Social, which was a similar length and angle. I got on pretty well (and confirmed Rhapsody at 8c+ in my own mind), but I couldn’t finish it by the end of the week. 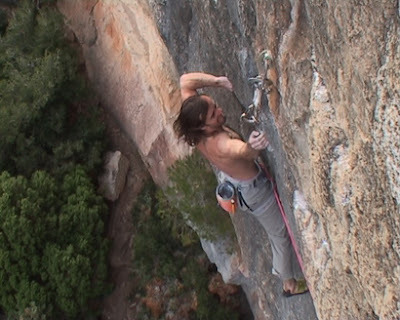 After I returned home, the idea that 8c+ on bolts, and on limestone could be possible for me galvanised it as a clear goal in my head, and I decided to come back to Siurana at the next opportunity. 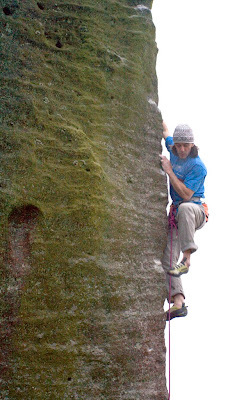 8c+ is by no means cutting edge in world terms these days, within sport climbing at least. But there are still not many all-round climbers who have managed it I suppose. In my earlier years of climbing, this level was still extremely rare, and only the most dedicated of athletes had reached it. So, although it’s just a meaningless number, it represents something that was inspirational to me when I started climbing and training furiously in my late teens. The idea that I could actually complete one myself was most definitely worth working through the final hurdle and booking more time in Toni’s refugi Siurana. I spent five more days on L’odi in November, but I paid the price of having tried to do too much in 2006. After taking a year of avoiding work and training for Rhapsody I had little choice but to take on stack loads of work to get on a financial even keel again during the summer and autumn. So my fitness was just not good enough and I had to settle for getting just past the crux. This time I was back with Claire. I knew the moves, the conditions were favourable for the Scots temperament (we don’t get on with the heat very well), and I had nine days climbing. Time enough to get used to the limestone, top up fitness, and hopefully get to the belay. Those sneaked in ice factor sessions sorted me right out, and on day two I made the last hard move, and couple of days later, wobbled through and clipped the belay. 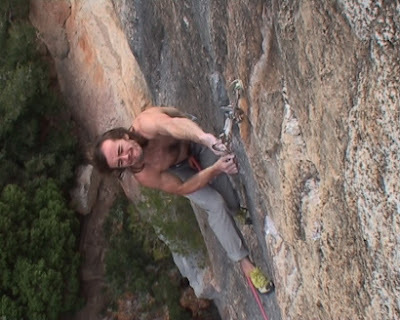 Here are a few video stills by Hot Aches of me climbing L'odi Social 8c+, Siurana, Spain. This one is just composing on an awkward undercut just before the crux section. Setting up for the crux (well, it was the crux for me anyway). As always when I get the opportunity to climb in famous sport climbing venues, I was both humbled and inspired by the performances of the world class sport climbers also out there. Of course, I am never satisfied, and breaking a new grade always leads to thoughts and plans of breaking the next one! With every grade higher you get, it becomes clearer that you are only limited by your desire to see if you can go further. I think that I have the motivation and possibly the resources to hand to work towards 9a. I am under no illusion that it will take some very significant changes in my habits to make it happen. I am psyched to have a go and see how I get on. I have to be careful though because my goals in winter climbing, trad climbing and bouldering are also high and will need work of a similar magnitude. But certain things should be easier for me in 2007 than in 2006 that should help me manage the physical workload. But for a brief moment before launching into all of this, I will be contented with nine good days with Claire in a lovely place, recharging batteries and doing 8c+. Claire starting up a 5+ in Siurana, I did start belaying after she clipped it! 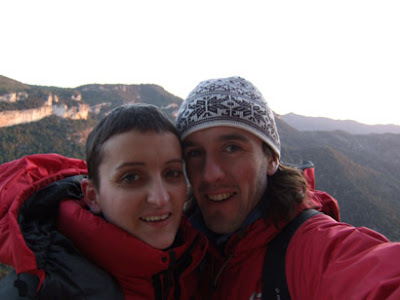 Claire, me and a chilly Siurana sunset. How did it get to February already? Two days ago I got back from my working mini-tour of the UK, lecturing and coaching (and writing while en-route to the next city). I was very pleased with how my work went on the whole, although I still need to learn to write more efficiently. Lecturing is still a strange experience for me even though I have done a great many now. My point of view in my lecture subject (the sport of climbing) is quite unusual and unique so what I am trying to do is communicate the reality of my experience to other climbers who have a very different experience and background. Not always easy. The biggest challenge is often describing how seemingly hard grades are actually very accessible if you get round the intimidation of seeing them as massive obstacles and start to see them as a series of small do-able steps. I definitely spotted a couple of audience members rolling their eyes as I tried to explain that the UK’s hardest trad routes aren’t really that bad. I wasn’t doing a very good job. The trouble with this kind of argument is that its easy to sound elitist when you have no backup from others. At least in E11 there is Niall McNair spelling out how crap I was at climbing in earlier years to underline the point that technique and strength are only one half of the jigsaw puzzle. Just deciding you are going to do something is the other half. Or maybe more than half. I guess what I was trying to say was not that E10 etc isn’t hard, it is, but rather that looking at your own levels of strength and technique on the rock as a measure to decide that you can never climb these grades is the wrong measure. Looking for the ability to open yourself up to the possibility of failure and the love of trying hard is really what needs to be done. 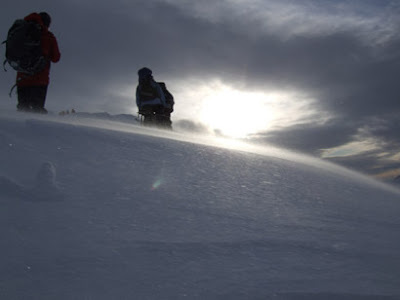 Andy K does an excellent job of showing how there is room for much British comedy amateurism even at an elite level in alpinism, so long as the psyche is there to get out there and just get it done, no matter how big the challenge. Of course in reality Andy is as switched on and prepared as they come, don’t let him fool you! But in his lectures I find myself thinking “I like what he does, but I could never do that”. My objective when talking about climbing or coaching it is to demonstrate that anyone can go much further than they realise, all that is necessary is a firm decision to go for it. I have much to learn here. In recent months I have coached many more climbers and learned a great deal about patterns in what holds climbers or sports people back. 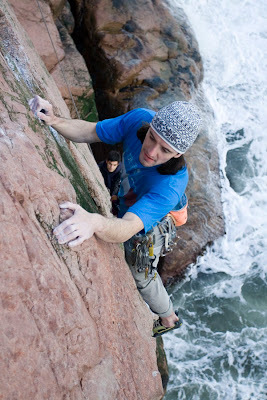 I can see that the overriding common theme is that most climbers simply don’t know how to try really hard. Of course I already knew this from my research in the area of maximum strength output. It was laughable to see how easy it was to influence the results of maximum finger strength scores just by varying the volume of your encouragement! This effect has been demonstrated directly in plenty of studies. The problem is that many climbers want to get better without trying hard. Unfortunately, beyond a certain limited level, this is not possible. Trying hard and getting outside your comfort zone is a bit like getting into the swimming pool. You want to toe dip and put it off as long as possible. But once you finally jump in, after a few minutes you wondered what all the fuss was about. The game is to find a way to love trying hard, instead of avoiding it. Once this is mastered, the rest is just going through the daily motions of bringing the body along with the mind. Anyway, I went on a tangent, sorry! Now my scheduled work is over I am in Spain waiting for the rain to stop, trying to write, and then maybe I can climb for a few days. 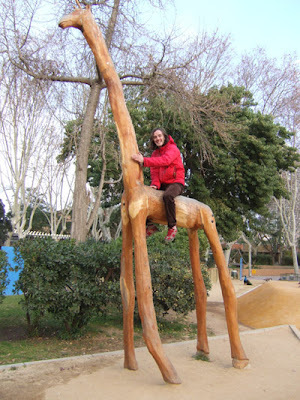 The picture is from yesterday at Barcelona Zoo. The Giraffe was quite polished and maybe about V1? At 1.30am I was still screwing holds on and testing the Men’s final route. At first I think it was about M10+ (Way too hard for a UK comp). But rather than have to reset the whole thing we just stuck the key in the adjustable leading wall and cranked the angle back 10 degrees to M9. The Comp was superb fun to watch. Tooling is always exciting stuff because the falls are so wild and the rescued near falls are even more wild! It’s going to be on the box (for BBC Scotland viewers anyway) on the Adventure Show at the end of Feb so keep an eye out for it (I’ll post up the time here once I know it). 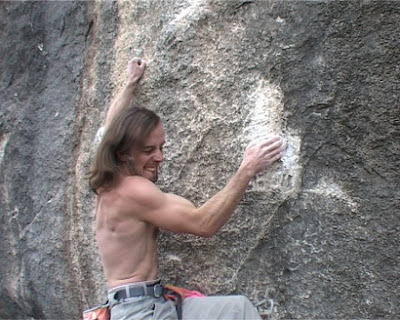 Tony Stone’s biceps looked a fair bit larger than last year and they took him to the belay on the final route, winning the comp. I don’t know about Dave, but I was certainly nerve wracked watching each ice and tooling route, praying that only one climber would reach the top. Amazingly that’s how it worked out. God knows how I managed to judge it, but I felt pretty happy afterwards that most people had a good day either watching or being part of the action. Every year my sponsors Mountain Equipment run a week of winter skills courses for outdoor retail staff which gives ME a chance to show their kit working in the environment its designed for, and for the shop staff to get out and learn the skills you need to travel about on winter mountains and have a good time too! Our base was the Plas Y Brenin’s Scottish home from home in Ballachulish. I joined in too for the crack and to do some presentations at night. These weeks are always a really interesting insight for me into the world of instructing and guiding climbing, not to mention talking about climbing gear a lot. Although it has many appeals and the Brenin team seem to have a whale of a time, I have never been keen to become a mountain guide myself. I’m lucky right now that there is a rapidly growing interest in coaching pure performance in climbing. Both disciplines have a massive variety of knowledge required to pass on to students, which make them very interesting. 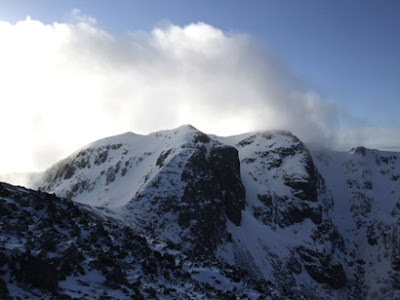 When it comes down to it I suppose I like performance coaching better because I get to deal closely with movement on rock and mental tactics as the ‘main course’ of the activity, and I don’t have to walk in to Stob Coire every day! However, the 4.45 return to the hotel for tea and cakes was most convenient, allowing time for a hasty fingerboard session in my room (once I’d found a decent doorframe) before dinner, and then a rapid fire session in the Ice Factor bouldering wall. One thing about training with very limited time is that it really helps you stick to priorities and get down to business. I had an excellent anaerobic 30 move circuit set in minutes and by home time my forearms looked like balloons. Returning back to a long term boulder project the following week I was amazed that I dispatched a link that has been two years in the making. Hopefully the endurance kick will help me out in Spain first, but afterwards its time to get serious and see if I can finish off the Dumby project. I am starting to feel my fitness returning. The spring is taking shape. Here are some more shots from the week. 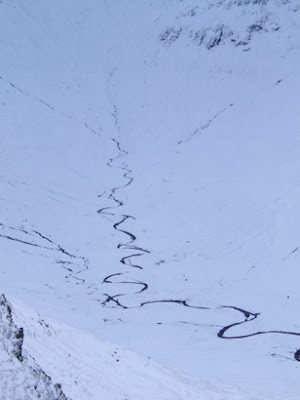 The one above is a wintery stream in the Mamores. 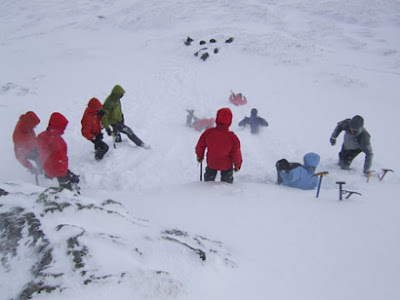 Practising Ice axe breaking on a wild day.